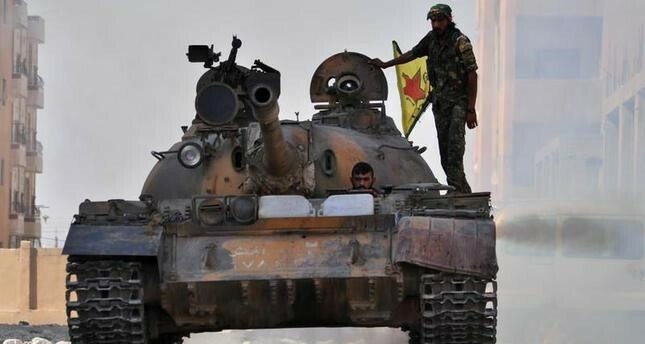 The Syrian Kurdish group Democratic Union Party (PYD) has seized the northern parts of Syria after forces loyal to President Bashar Assad abruptly abandoned Kurdish cities in 2012. Since then, Turkey has claimed that there was a solid link between the PYD and the Northern Iraq-based radical Kurdish nationalist PKK, recognized as a terrorist group by Turkey as well as Western countries. Although the connection between the two parties has been established as a fact within many academic circles, Turkey's NATO ally the U.S., currently refuses to recognize that connection and claims that despite their ideological similarity, the groups have separate decision-making processes and that there is no organic attachment between them. The U.S. officially designated the PKK as a foreign terrorist organization in 1997, but for reasons associated with the struggle against DAESH, the U.S. is willing to work with the PYD. A report published by the Atlantic Council has detailed the widespread presence of Turkish citizens in the ranks of the PYD's armed wing, the People's Protection Units (YPG). Casualty data from the YPG compiled through open sources confirms links between the YPG and the PKK. Kurds from Turkey total roughly 50 percent of Kurdish casualties between 2013 and 2016. Salih Muslim, the current chairman of the PYD, has also implicitly accepted that there were hundreds of PKK militants in the ranks of the YPG. "It is quite natural for a Kurd who was formerly one of the [PKK] fighters in the mountains to defend his home" Muslim told the London-based Al-Quds Al-Arabi newspaper last month. But this information is not enough to reach a conclusion in the eyes of American officials as well as other commentators who are sympathetic to the PYD's cause in Syria. This is why we decided to investigate the PYD-PKK connection in the PKK archives, past news stories and testimonies. We found strong organic links between the two organizations. The Kurdish insurgent group PKK, established in 1978 by Abdullah Öcalan and headquartered in Syria from 1979 to 1998, was forced to leave Syria after Turkey threatened war against Hafez al-Assad's Syrian regime, which was providing logistics and training for the Kurdish militants. Many accounts suggest that a new party had to be founded after this development, since the PKK still had strong support in the country's north. Syrian Kurds had a presence in the PKK's ranks as well, and they are generally referred to as "undocumented" by the Turkish authorities, since the Syrian regime didn't recognize them as Syrian citizens. Research carried out in 2007 by James Brandon of the Jamestown Foundation suggests that twenty percent of PKK militants were Syrian nationals. The PKK's official magazine, Serxwebûn, (Independence), mentions the name of the PYD for the first time in its May 2002 issue where the documents of the PKK's 8th General Congress were compiled. "Our Congress should make assignment and create a Democratic Union Movement of Syria or Democratic Union Party, and support it as part of our movement in upcoming days." Osman Öcalan, the younger brother of the imprisoned founder of the PKK, Abdullah Öcalan, and also a senior PKK commander at the time, said that he founded the PYD in 2003. He stated in an interview with Iraqi television Zelal in 2013 that, "I founded the PYD, as I did PJAK (the PKK's Iranian arm). We did not use the word "Kurdistan" in the party's title since we did not want to provoke the Syrian regime. The PYD is connected to the PKK, and acts upon on PKK orders." In a separate interview given to the Turkish daily Yeni Akit, Osman Öcalan said that the PKK decided to establish the PYD while bearing in mind a possible US intervention in the region. "We held the first general PYD congress in October 2003. We trained the cadres." 2003 was an important year for the PKK. Following his 1999 arrest by the Turkish authorities, Öcalan tried to redesign the party based on an "updated" philosophy that ended the organization's demands for independence and instead prioritized a confederated struggle within the existing states of Iran, Turkey and Syria. The PKK changed its name after a congress in November 2003, and established the "People's Congress of Kurdistan," or Kongra-Gel. The PKK's armed wing, the People's Defense Forces (HPG), which has been operating since 2000, preserved the previous organizational scheme and continued its operations without regard to the PKK's name change. Turkish newspapers reported the establishment of the PYD in May 2004, referencing unnamed Turkish officials. The Cumhuriyet daily said that the PYD was founded to shield the PKK/Kongra Gel's illegal activities in the region. It said the riots in Syria's Qamishli village, which occurred in March 2004, "were provoked" by 2,000 PKK militants. The Syrian state was planning to destroy the remaining party cadres since the leadership was dispersed. The PYD party was established under the shadow of these liquidation operations in the four parts of Kurdistan. The PYD was the first party in southwestern Kurdistan, and tried to create its own perspective. There is no doubt that PKK militants were the PYD's original founders, because its current leadership still commemorates the five founders, who were members of the PKK's armed wing the HPG, and were later assassinated in Iraq's Mosul. Following the Syrian regime's 2004 crackdown in northern Syria against the PYD, the party's political committee decided to move to Northern Iraq to review their strategy: namely Şilan Kobani (Meysa Baqi), Zekeriya (Zekeriya İbrahim), Fuat (Hikmet Tokmak), Cemil (Nebo Ali) and Ciwan (Hacı Cuma Ali). A group of comrades were assigned to re-construct our democratic struggle in south-west Kurdistan. Comrades Şilan, Fuat, Zekeriya Ciwan and Cemil were chosen to do this task. These comrades, who were martyred in Mosul on November 29, 2004, would take a memorable place in the history of the Apoist (Abdullah Öcalan) movement. Şilan's formal area of work was Syria but Syrian state was looking for her, this is why it was better for her to perform her work in Iraq. She was coordinating the PYD tasks from Iraq. This area was formerly belonging to our leadership (Abdullah Öcalan) and for Syria and Turkey it was important to take over this territory to weaken the PKK. Our enemy thought "if we weaken the PKK in southwest Kurdistan, then they would weakened everywhere. Comrade Şilan played a vital role to expand PYD as an organization. This is how the PYD survived. The PYD officially recognizes its fallen members and regularly commemorates the date they died. For example, according to pro-PYD Kurdish news agency ANHA, the PYD last year issued a statement in which it commemorated its former founders, who were "martyred" by "a conspiracy" on November 29, 2004. The statement says that the construction of social revolution in Syria was possible thanks to these leaders, especially Şilan Kobani, also known as Meysa Baqi. Şilan Kobani, who joined the PKK in 1998, has a special place in the PKK's cadres. The PKK's official websites and magazines have published multiple articles and interviews in memory of her. The PKK also declared her a symbol for new PKK cadres in its" Remodeling Congress" held in 2005. The PKK's armed wing HPG lists Şilan Kobani (Meysa Baqi), Zekeriya (Zekeriya İbrahim), Fuat (Hikmet Tokmak), Cemil (Nebo Ali) and Ciwan (Hacı Cuma Ali) among their 2004 martyrs. Turkish newspaper Milliyet, confirming the PYD leaders' membership in the PKK, reported that five senior PKK/Kongra-Gel commanders were assassinated in Mosul's Shingal. The PYD is today connected to the PKK in a framework, a supreme body called the KCK that supervises the associated organizations created by Abdullah Öcalan while he was looking for new ways to increase his outreach across Kurdistan. Öcalan's change in philosophy continued to transform the PKK/Kongra-Gel structure and led to the birth of Koma Komelên Kurdistan (KKK), or in English, the Kurdistan Confederation of Communities. The PKK decided to establish the KKK during its general congress in March 2005, during which the PKK and PYD commander Şilan Kobani was honored. The KKK's founding articles defined the organization as a community within Kurdistan, which has territories in parts of Syria, Iraq, Iran, and Turkey. Öcalan described this system, which has an executive committee, a representative assembly called Kongra-Gel, and a judiciary branch, as an effort to create direct democracy within Kurdistan through the collaboration of Kurdish people in different countries. Kurds can develop a democratic dialogue or method with the states they live in. Kurds wage a struggle within the understanding of democratic nation. This is why the KCK represents all Kurds. The KCK can be in talks with Iran, Syria, Turkey and Iraq on behalf of Kurds. The KCK's articles state that Kurds must set up their own organizations within the national states, Iraq, Syria, Turkey, and Iran, where they can build up local branches and together create a model of democratic con-federalism. Turkish authorities labeled the PYD as the KCK's Syrian branch in 2009. At that time followers of powerful imam Fethullah Gülen in Turkey's judiciary and police forces launched an investigation against the KCK in order to derail the government-led peace talks with the PKK, which they perceived as a threat against their local educational activities. The prosecutors claimed that the organization's Turkish branch was named KCK/TM. The PKK's confederal council KKK, later known as KCK, released a statement in 2006 for that year's Nevruz celebrations in which they acknowledged the PYD as their arm in western Kurdistan. The KKK Executive Council said, "The PYD, as the KKK organization's arm in Western Kurdistan, tried to restructure itself and create a system by holding a general congress." The PYD considers Abdullah Öcalan as its leader and KONGRA-GEL as the supreme legislative body of the people of Kurdistan and KCK/Rojava as its system of democracy for Kurdish people in Syria. Later the party replaced KCK/Rojava with TEV-DEM, (Tevgera Civaka Demokratîk or Movement for a Democratic Society), which was established after the PYD achieved control over large swaths of territory inside the Syria. The PYD's internal code shows clearly that the PKK/Kongra-Gel has direct authority over the party. U.S. State Department has also designated the PKK's new name, Kongra-Gel, as a terrorist organization. The PYD approved a new internal code in 2015 that removed the references to the PKK/Kongra-Gel. We are building a community of democracy in Western Kurdistan. We are preparing our people for a political fight. This is why we established a new community in Syria's Kurdish region, it is called KCK/Rojava. Ömer, referencing Abdullah Öcalan, says that they had intensified their efforts to consolidate a "Democratic Confederation" in Syria. According to research by Michael Gunter, who published a book on Syria's Kurds, Salih Muslim was elected to the PYD leadership in 2010. He was forced to flee Syria due to harassment and long detentions by the Syrian regime. Gunter claims that Muslim took refuge in Iraq's Qandil Mountains, where the PKK and PYD established a joint headquarters. A Le Monde report from 2011 confirms the veracity of the story. Muslim himself says that the PYD had a base in Northern Iraq's Gare Mountains, where he also sheltered for a while. A PKK militant arrested in 2008 by the Turkish authorities, during court proceedings claimed that PKK had a camp in Gare. An interview with Muslim published in 2011 by KurdWatch, an independent group of experts reporting on Kurdish rights violations in Syria, details his views on the PKK and Abdullah Öcalan. Muslim defended the PKK's murders of Kurdish critics in Syria by terming them "traitors" or as people who had caused harm to the PKK. He also said that the PYD was a political organization, and that betrayal was punishable by death. KurdWatch: A few weeks ago Duran Kalkan, a member of the leadership council of the Kurdistan Union of Societies (KCK) said that the PKK in Syria is in a fight against the AKP [Turkey's ruling party]. Cemil Bayik, another member of the KCK leadership council, allegedly said that the PKK will wage a war against Turkey if Turkey gets involved in Syria's internal affairs. What does the PYD think of this? Salih Muslim Muhammad: Yes,this is our position as well. We have the same philosophy and ideology. What is meant, however, is political war. If Turkey positions itself against the existence of the Kurds, then we will not be silent about it. In the last ten years, in which Turkey has maintained good relations with the Syrian state, it has also installed many henchmen among the Kurds. Turkey's henchmen in Syrian Kurdistan are responsible for the unrest here. Turkey is afraid that the Kurds in Syrian Kurdistan will receive their rights. The PYD established its armed wing, Yekîneyên Parastina Gel or People's Protection Units (YPG) in 2004, according to a YPG fighter who spoke to Vice News in 2012. The YPG and PKK's armed wing, Hêzên Parastina Gel or People's Defense Forces, (HPG) have many similarities. Both armed organizations have similar name, acronym and flag. The HPG had notable Syrian commanders: for example, Fehman Huseyin (nom de guerre of Dr. Bahoz Erdal) was the commander of the central headquarters until 2009. Another Syrian Kurd, Nurettin Halef Al Muhammed (Sofi Nurettin) took over the command. But the Syrian hold on the leadership ended when Murat Karayılan was assigned to this position in 2013. A Turkish daily reported in 2012 that more than 200 Syrians were holding important positions in the PKK. According to Michael Gunter and based on information he received from Syrian Kurdish activists based in Germany, the PKK assigned a general commander for YPG forces, Ferhat Abdi Şahin (Şahin Cilo). A PKK militant's testimony to Turkish authorities in 2012 confirms that Cilo was the YPG's chief commander in Syria. Some Turkish dailies had also previously claimed that Cilo was Öcalan's surrogate son. Habertürk daily published the most interesting part of this story depicting the new roles performed by both Sofi Nurettin and Şahin Cilo. According to the story, by 2013 Sofi Nurettin was in charge of Syria operations and Şahin Cilo was his deputy. Although the U.S. State Department disagrees with Turkey's stance on the connection between the PKK and PYD, American diplomatic telegrams published by Wikileaks confirm that the State Department was well aware of the link between the two groups at an early date. We asked Messud Akko (strictly protect), a Kurdish journalist and human rights activist who claims no specific party affiliation, and who stood with us on the fringe of the rally, if PYD and PKK were really the same thing. He said they were not. "PYD," he told us, "is political." When we asked him if the camouflaged guerrillas marching in formation across the stage were PYD, he smiled and said, "No, they're PKK." Other Kurds with whom we spoke made the same distinction as Akko." Regarding the PYD, Bashar told Baghdy it was a essentially an operational unit of the PKK, had no scope for independent action in Syria, and its connections to other Kurdish parties in Syria were "shallow." The information provided in this report provides an essential framework to understand the PYD's relations with the PKK. There can be no doubt that the U.S. administration knows that the PYD is controlled by the PKK. Apparently no evidence, other than a change in U.S. strategic thinking, would be enough to convince them that the PYD is the political or military affiliate of the PKK in Syria. Further research and detailed interviews with Polat Can, a PYD spokesman whose pictures from PKK days were recently poured onto social media, could provide background for the PKK-PYD relationship. However since 2012 the PKK and KCK have developed a narrative that rejects any ties with their Syrian affiliate, in order to play up to the U.S. That's a clever strategy, considering Turkey's reaction to the PYD's seizure of large swaths of territory in the country. Regardless of this, Turkey will continue to bring this issue up in international forums and if provoked, will not hesitate to use military power against the PYD.